This is the second part of this series, looking at the making of bespoke jeans in the Levi’s Lot No.1 service. Read about the commissioning, background and pricing here. 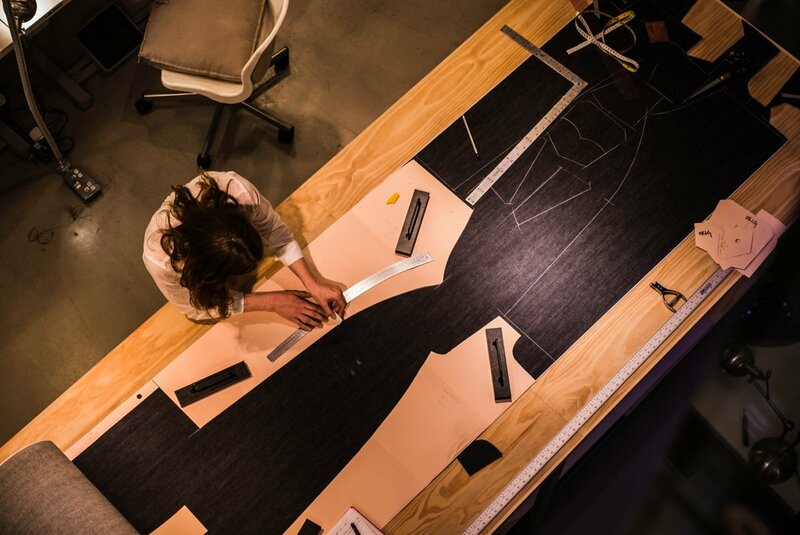 The process of cutting bespoke jeans is not that dissimilar to regular bespoke. One small difference is that the denim is too thick to double up, so Lizzie (Radcliffe, pictured below) must cut all the pieces of the trousers individually. The pieces of a bespoke suit are normally cut ‘on the double’, with one trouser or jacket section being placed on top of two layers of cloth, and both cut together. One advantage of denim, however, is that Lizzie can cut the denim on the right side (tailors normally cut on the back of the cloth) which makes things a little easier. 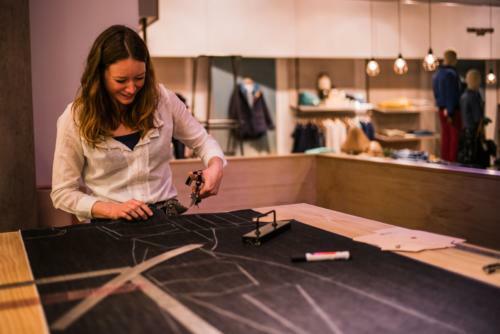 She outlines the paper pattern onto it with white chalk – which presses off just as easily as on a suiting – and cuts into the raw denim. This is hard work, and by the end of the day it leaves the hands pretty tired (as well as stained slightly blue). 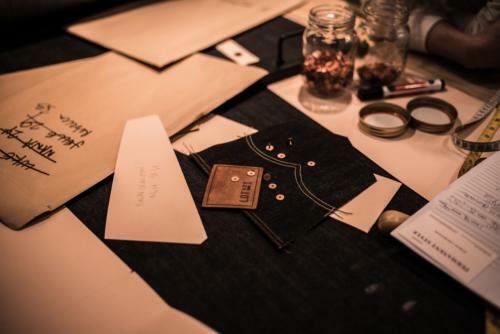 One aspect that isn’t bespoke is the back pockets and trade mark ‘arcuate’ Levi’s stitch. The shape of both has to fit precisely with the Levi’s style, and therefore Lizzie uses templates that are sized up or down depending on the customer. You can see one of the pockets in the middle of the pic above. An extra-powerful iron is used to press the denim, such as the edges of the pockets. 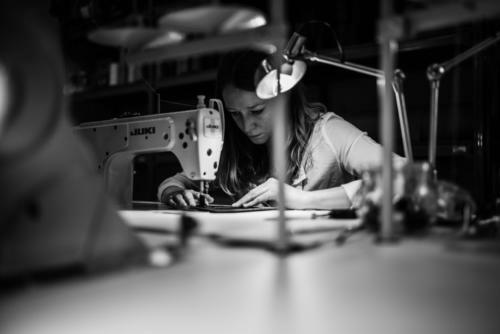 The pieces are then moved over to the machines, of which there are six types: for overlocking, for overlocking and chain stitching, for stitching buttonholes, for riveting, for bar tacking, and for applying buttons. All are fairly straightforward, although the buttonhole machine (below) is a beautiful piece, around 30 years old, and the smoothest to work with as a result. 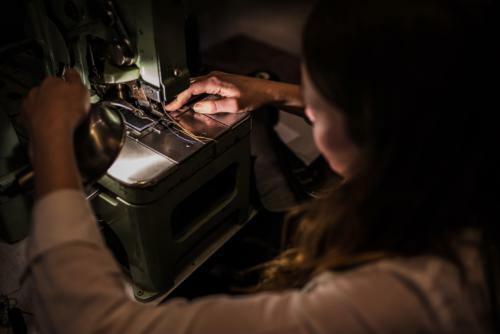 You can pick many things as part of the bespoke service, including the colour of the overlocking thread, the buttonholes and the archuate stitch, the metal of the rivets and buttons, and the leather of the Lot No.1 patch on the back. As I was after a fairly classic style, however, and the fit is by far the most important thing, I opted for standard orange (‘spice’) stitching everywhere except for a yellow archuate. You can see my choices below. Lizzie has had lots of requests for strange personalisations, including having the selvedge on the outside of the jeans and the overlocking around the outside of the pockets. But there is only so much Levi’s can vary before it stops being a pair of Levi’s (quite apart from the lack of taste). If ‘dress jeans’ are your thing, though, and you want navy stitching and a black patch, that’s certainly possible. Photos of the finished product soon. You can follow the discussion on Levi’s bespoke jeans – the making by entering your email address in the box below. You will then receive an email every time a new comment is added. These will also contain a link to a page where you can stop the alerts, and remove all of your related data from the site. “Dress jeans” are a real thing at least in the software industry. An upgrade from shorts and sandals and somewhat of a sprezzatura for supposedly “cool” execs who have to bridge the gap between short wearing devs and suit wearing execs. What makes a pair of jeans “dress jeans”? No contrast stitching? No rivets (or whatever the metal bits are called)? Other things? Well here in the Bay Area, dark denim, straight cut, few embellishments (like no fancy back pocket stitching), not worn looking. Jeans at work especially in tech has been the norm for quite some time. How you would describe the style and fit of your bespoke jeans? Is it classic like a 501 ?